The ‘776 patent provides a new multiplayer feature for the user. One of the users has a car different from the others (for example, player 1 can be a cop car while the other players are sports cars). All the cars are designed, when playing this mode, to have the same features so that no car has an unfair speed advantage over the other cars. The user who starts as a different cop is the ‘predator’ whose goal is to catch the other players (the prey). A prey is caught whenever his car is run into by a predator, which then turns the prey into another predator to help hunt the remaining prey. The last player to remain as prey is the winner. Methods and systems for administering and playing a multi-player computer game are disclosed. During the multi-player computer game, players are either identified as a predator or as prey. The predator players attempt to catch the prey, and the prey-players attempt to evade the predator(s). When a prey is caught, the caught prey becomes an additional predator. During game play, predator players’ display screens may display a directional arrow indicating the direction of the closest prey, and may also display a map indicating a position of each remaining prey. 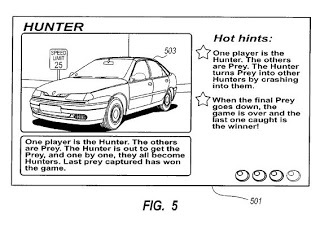 Predators may be displayed on each participants display screen with a first graphically depicted appearance (e.g., a police car), while prey may be depicted having a second graphically depicted appearance (e.g., a sports car). The game ends when no prey remain, and the last caught prey is the winner. 1. A computer-implemented method for playing a multiplayer computer game comprising an automobile driving simulation, comprising steps of: a computer identifying at least one player on a first team and a plurality of players on a second team, each player corresponding to a different automobile in a graphically depicted simulated driving environment in which the multiplayer computer game is played, wherein the at least one player on the first team has at least a first corresponding automobile with a first graphically depicted appearance and all of the players on the second team have automobiles that are graphically distinguished from the at least first corresponding automobile, and wherein each automobile of the at least one player on the first team is given enhanced capabilities so as to always have at least a same speed and capabilities as a fastest and strongest automobile corresponding to all of the plurality of players on the second team and regardless of any type of automobile that is being driven by the at least one player on the first team; initiating game play, during which each player on the first team tries to catch any player on the second team in the graphically depicted simulated driving environment, wherein a player on the second team is caught when a player on the first team drives the at least first corresponding automobile into an automobile that corresponds to the player on the second team; when any player on the first team catches any player on the second team by driving the at least first automobile into the automobile corresponding to the player on the second team, reassigning the caught second team player to the first team by at least changing an appearance attribute of the automobile corresponding to the caught second team player to reflect that the second team player is assigned to the first team and such that the automobile corresponding to the caught second team player has a changed graphically depicted appearance that is graphically similar to the first graphically depicted appearance of the at least first corresponding automobile; and ending game play when a predetermined event occurs.